Editor's note (July 13, 2012): We have updated this review to include the C3760dn's speed-test results on the Mac platform. The $649 (as of June 28, 2012), ethernet- or USB-connectable Dell C3760dn color laser printer is an office workhorse. It has the speed and capacity to handle high-volume printing. The controls and four-line LCD are simple and effective, the print quality is quite good, and maintenance is easy, too. But before you start printing a ton, note that although its black toner is very affordable, its color toner can be pricier than average. Paper-handling features on the C3760dn include automatic duplexing, a 550-sheet bottom-mounted input tray, and a 150-sheet multipurpose tray that folds down from the front of the unit. A second, bottom-mounted 550-sheet tray is available for $189 if you need more capacity. A 250-sheet output tray sits on top, and a USB port for direct printing resides next to it. You can save $100 by purchasing the otherwise identical C3760n, which lacks automatic duplexing; however, that small savings may cost you later in manual-duplexing hassles as well as paper costs. The C3760dn is sturdily built, and you can easily reach cartridges for replacement by opening the front of the unit. To access the 60,000-page drums, you first flip up the top output tray, and then open the right-side panel. Remove the toner catch, and the units simply slide out. A panel on the left side of the unit, secured by a thumbscrew, gives you access to both the motherboard and the single open memory slot for upgrading the printer's standard 256MB with a DDR2 SODIMM of up to 512MB, for a maximum of 768MB of memory. The quality of the C3760dn's output is quite good. In our tests, text appeared sharp and black, and grayscale graphics looked decent for a laser printer. Color graphics, while not up to the standard of the best inkjets, were certainly good, even in photos. At default settings, color was slightly oversaturated, with a bent toward orange that was most apparent in reproductions of human faces. Fortunately, you can find numerous controls in the printer dialog box--brightness, contrast, chroma, and individual color levels--that allow adjusting to taste. A technical note: When the printer arrived, the colors were off-registration. This was obvious from the off-kilter, semi-3D look of initial color prints. All color lasers have some mix of automated and manual tools to maintain good registration. The C3760dn has an automatic registration adjuster that can make small corrections on its own, but this problem was clearly beyond its ability. We ran the printer's correction utility, which fixed the problem for the most part. We also performed a manual registration, which requires printing a test page and entering numbers associated with the correctly aligned colors into the control panel--a bit of a hassle, if possibly a little fun for geeky sorts. If you take this step, have a magnifying glass or loupe handy. 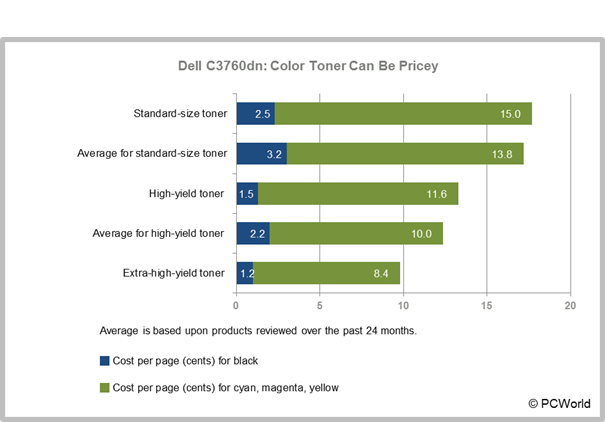 Black toner costs for the C3760dn are quite low: 2.5 cents per page with the standard $75, 3000-page cartridge; 1.54 cents per page with the $108, 5000-page cartridge; and 1.2 cents per page with the extra-high-yield, $135, 11,000-page cartridge. Color, on the other hand, is something you'll want to conserve unless you select the extra-high-yield supplies. The 3000-page cyan, magenta, and yellow cartridges cost $150 each, or a higher-than-average 5 cents per page, per color. The price remains slightly higher than average with the 5000-page, $192 supplies, which come out to 3.85 cents per page, per color. The $255, 9000-page extra-high-yield color cartridge costs a very affordable 2.8 cents per page, per color. Drums and the toner catch add about 0.25 cents per page to the cost. The C3760dn is fast on the PC platform, but noticeably slower on the Mac platform. With our test PC, its speeds were well above-average: Snapshot-size (4-by-6-inch) color photos printed at about 4.0 pages per minute to both plain and glossy paper, while monochrome pages consisting primarily of plain text, plus a few simple graphics, averaged a swift 20.1 ppm. With our Mac, however, those same monochrome documents printed at a much slower rate of 14.7 ppm. The C3760dn also lagged behind the average times on other Mac tests: A four-page PDF containing a lot of color graphics printed at 4.4 ppm (average: 4.8 ppm), and a full-page, high-resolution photo printed at 0.7 ppm (average: 1 ppm). The C3760dn carries only a one-year standard warranty, though the company provides options for up to four years. If they're anything like those offered for similar Dell color lasers, the options should max out at about $250. Dell quotes a monthly duty cycle of 80,000 pages. The Dell C3760dn has very nice output quality, tons of capacity, and sufficient speed for most high-volume scenarios. Stick with the high-yield supplies if you have the volume to justify it; despite the large initial outlay, it's the most affordable consumables option. For workgroups, this printer offers speed and good-looking output, plus low-cost black toner, in a no-nonsense package.